It's one of those muggy days where you can cut the humidity with a knife. 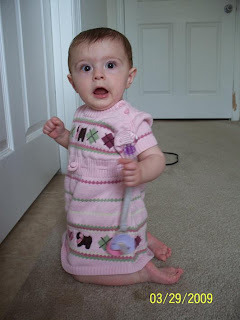 Without any thought for weather and temperature, I put my daughter in a short sleeved sweater dress. I have this firm commitment that she shall wear every dress in her closet at least once and be photographed in it (I think this dress is from one of the baby showers - we are blessed with so much clothing we forget who gave each item). Hey look at that! 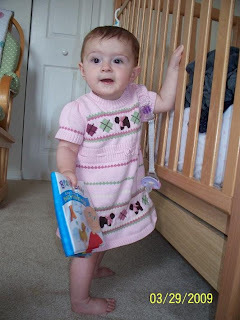 She pulled herself up on the cot and is standing! Is that a copy of Brainy Baby she's holding? Yeah that's right! She's just learned to crawl 3 weeks ago and now there's no stopping her. Check out that awesome dress! She can stand and crawl but still exits the bed head first, followed by a roll and she's off! She's too fast for my poky camera to provide a 3 step photo demo. 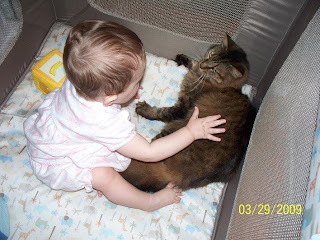 Only one way to teach Princess the playpen belongs to Charlotte - see the terror in kitty's eyes as the baby leans in for a bear hug. Notice the outfit change? 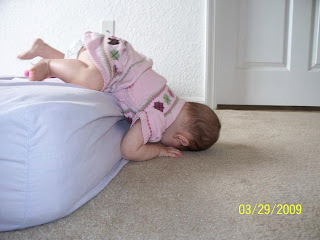 We had a meltdown as baby got over heated and over tired. Will I ever learn??? 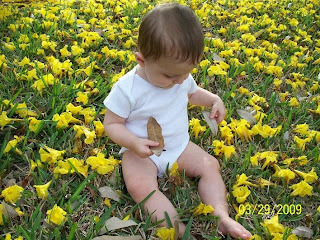 Bored with being inside, we decide to sit under the tree with fallen yellow flowers. Notice the outfit change? Gezzz having an artist for a mom is tedious at times but the end result is fun. I wonder why she selected two brown leaves? I like the technique getting off the bed. what a beautiful picture, sitting in a field of flowers. lovely. She's a cutie! Getting prettier and prettier each time I see pictures!